It’s hard to believe that 28 days have come and gone during my 28 Day Challenge with Olay Luminous. My skin has always been a personal and touchy topic. On the blog, I’ve confessed to dealing with embarrassing skin issues such as hyperpigmentation, ingrown hairs, and acne. As I’ve gotten older, the acne has subsided and I only have occasional flare ups. But, the dark marks tend to linger longer. This could be because they take a long time to fade. When Olay reached out to me about their skin challenge, I couldn’t pass up the opportunity. This is a sponsored conversation with Olay but all opinions are my own. This is my journey during the 28 days that I used their Luminous skin care products. If you are just now hearing about my #Olay28day challenge, let me give you a brief recap. My first day on the challenge was Friday, September 15th. And every day since that day, I’ve been using the Olay Luminous products exclusively. Morning – Apply Olay Luminous Miracle Boost Concentrate and Olay Luminous Light Hydrating Lotion. Evening – Remove makeup with the Olay Luminous Micellar Water (LOVE this stuff! ), apply Olay Luminous Miracle Boost Concentrate. First, let me say that I’m not one to use skincare routines. The last time I used a product line exclusively and consistently was 2 and half years ago. So this was definitely a new experience for me. My absolute favorite product from the collection was hands down the Olay Luminous Micellar Water. This product made my skin feel so extremely smooth and clean, without the drying effects. As soon as I got home from work, I couldn’t wait to soak a cotton pad and clean my face with the micellar water. It’s reminiscent of witch hazel and is the gentlest skin cleanser I’ve ever used. The Olay Luminous Miracle Boost Concentrate is designed to perfect your skin tone. It helps to fade dark spots and uses Pearl-Optics™ Science to enhance skin’s absorbency with hydration. While my deepest scars are still present (and slowly but surely fading), I noticed how some recent acne scarring on my forehead has all but disappeared. Besides that win, I have also enjoyed the dewy effects of using a daily moisturizer consistently. Typically, I shy away from moisturizers for fear of feeling overly oily. My skin is naturally very oily so I’ve always figured that I don’t need to wear a moisturizer. Since using the Olay Luminous Light Hydrating Lotion daily, I’m enjoying a more dewy complexion which is lovely. Also, after wiping my face with water in the morning, I’m no longer experiencing ashy skin around my chin. This is because I’m using the Light Hydrating Lotion afterward. The biggest take away from this challenge was the confidence that I’ve gained. Black skin is so special. It’s so special that I named my blog after it! 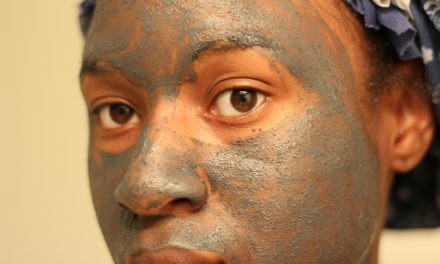 Black skin deserves extra care because it’s so unique. And while we might be prone to certain skin conditions that can be embarrassing, it feels good to know that there are products designed with US in mind. I feel that Olay has really taken into consideration the skin issues that matter to African Americans and it’s been fun experimenting with their Luminous collection. Thank you Olay for helping me further embrace my skin. My black is beautiful skin. You can shop the products mentioned in this post here.